I started imagining this design a few months ago (cerca 1999) while I was reflecting upon the many recent discussions regarding passive radiator operation. 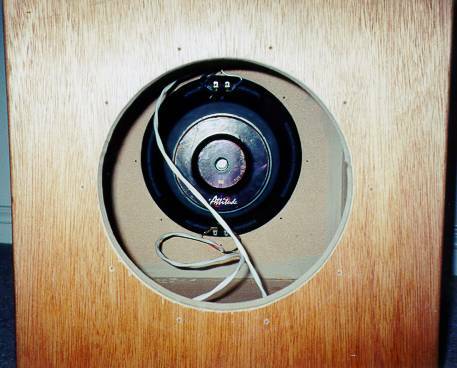 Especially thinking about Deon Beardon's The Beast 18" subwoofer which uses a single 18" active driver and (3) 18"passive radiators. So I made up this little sub I call The 10Triple10. 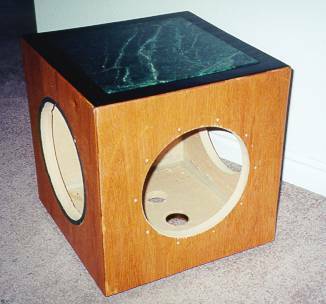 This subwoofer is a 10" woofer in a small enclosure with (3) 10" passive radiators. 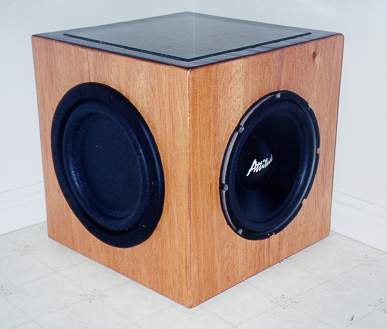 All I can say about this subwoofer is its performance is completely remarkable. 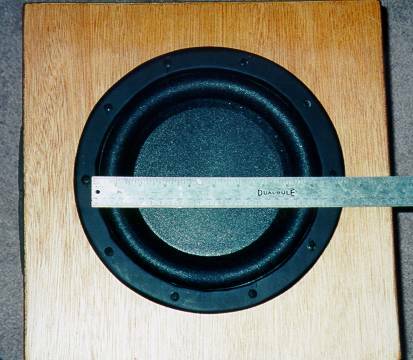 You'll think that either your eyes or your ears are deceiving you to believe that a subwoofer this small can produce such enormous amounts of truly deep bass. This sub loves low notes. It's just playing along having a good time up above 40 Hz, but when those notes start to get into the 20's, it's like the sub drops into overdrive. So anyway, enough salesman talk, here's the real deal on the design, production, and test results of my all-mighty 10Triple10 Subwoofer. The speaker starts with Ultimate Attitude's 10" AU1040 subwoofer. A sub designed for car audio, but since I haven't seen many inexpensive home theater subs in the 10" range on the market for DIY, I went ahead with this sub. 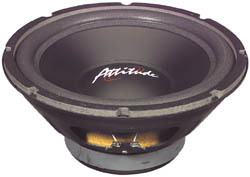 The specs are listed here: Attitude AU1050 10" Stamp Frame Woofer. 250 watts RMS/350 watts max *Impedance: 6 ohms per coil *Frequency response: 25-200 Hz *Magnet weight: 50 oz. *Fs: 29 Hz *SPL: 89 dB 1W/1m *Vas: 3.50 cu.ft, *Qms: 8.20 *Qes: .45 *Qts: .43 *Xmax: 9.9mm. *Net weight: 9 lbs. *Dimensions: A: 10-1/16", B: 9-1/8", C: 5-1/16", D: 5-1/4", E: 1-1/4". The passive radiators were custom built from flat pieces of machined MDF with a large thick foam surrounds. Each PR has an Xmax of around 10 mm. These diaphragms originally would have gone into making a full-blown PR, but I got to them before they made it that far down the assembly line (in a sense). So we're talking really cheap flat PR's but with nice thick surrounds and a solid machined MDF diaphragm. Each PR had an initial mass of 90 grams. To the right are a few thumbnails of shots taken from Brian's ported.xls. 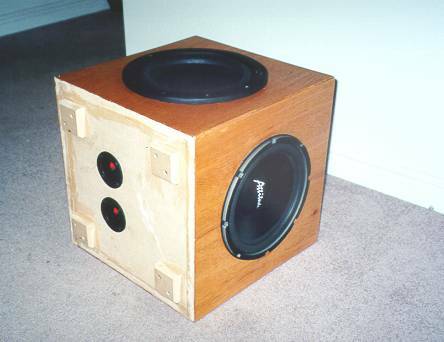 I wanted the box to look proportional with the (4) 10" speakers on each side. A cube seemed the logical choice. I didn't want too much extra space on either side of the woofers either. So I decided on 15" all the way around and plugged in the T/S parameters into a few programs to see if this driver would work in a 1.35 ft^3 box. 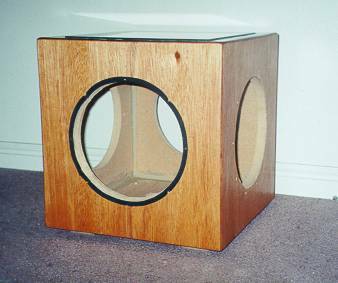 A lot of times you can get away with making the box smaller than normal if you can tolerate a hump in the frequency response and higher f3. In this design, I can get rid of any hump by tuning the box much lower than would normally be possible with an ordinary port. Small Box + Low Tuning + PR = Lower Hump in FR. So here's the final Frequency Response Plot, SPL Plot and Excursion Plots of the 10Triple10. I deciding on a tuning frequency of 30 Hz, since that dropped the hump from +3 dB to only +1.3 dB. I could have gone as low as 25 Hz for the tuning and probably had acceptable results as well. But I wanted to keep from having to add too much mass to each PR. I was afraid that if they were too heavy, they'd cantilever. Adding mass to a flat PR was tricky, I didn't want to weigh down one side more than the other making it "lopsided". I used 9 washers that weighed 18 grams a piece to mass down each passive. So how did I know to add (9) 18 gram washers? I used passive.xls which is available here at my site. I entered in the parameters of my passives and the fB and size of the enclosure. I found Sd by measuring across the diameter of the PR plus 1/3 of the surround on either side. This came out to be really close to 7.50" See the picture to to the right. Although you can't see what the ruler says, this shows how it is possible to find the Sd of a driver or PR. Sd = pi*(D/2)^2. Then do the proper conversion to cm^2 or m^2. So from the spreadsheet it looked like I would need to add 160 grams (for a total of 250 g) to each PR for a tuning of 30 Hz in a box totaling 1.35 ft^3. And that was that. Now it was time to build the box and put the PR's together. I won't go into any detail on box construction. But you can see quite easily from the pictures how the box was made. 3/4" MDF with 1/8" mahogany plywood and a rad slab of green marble on the top framed by a black border. It's stained in Light American Oak from Minwax. 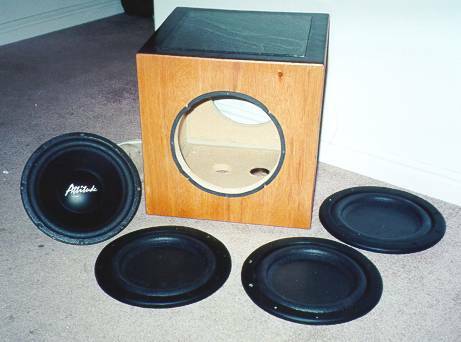 To the right you'll find pictures of the last stages of building this subwoofer. That's all I have to say for now. From an initial comparison, this sub was keeping up with a single Shiva in a 3 ft^3 ported enclosure. Now that was an amazing thing to hear! Though it didn't have the volume. After I put the box together and screwed in all the speakers, I did an fB test to see if I hit my targeted 30 Hz and lucky for me I hit the 30 Hz perfectly. Just a little bit of info regarding how the frequency response was measured. The sub was measured in my front yard so as to avoid all reflections from walls and ceilings. This is about the best anechoic response you can get. Only the ground is capable of interfering with the results. I used a precision frequency generator, frequency counter, amplifier, and my trusty Radio Shack analog SPL meter. The sub was placed in the grass as far way from the house and any walls as possible, while the SPL meter was placed at exactly 1 meter from the front baffle at the same height as the dust cap. I ran 9.75 volts into the driver which has a nominal impedance of 3 ohms which roughly equates to 31 watts. 31 watts is very conservative but even still I was able to get the PR's to cantilever at 30 Hz and below. I then plotted the SPL at 5 Hz increments starting at 15 Hz working my way up to 100 Hz. I accounted for meter correction and plotted the results in Excel. That is the graph you see to the right. In-room response of the sub would improve the low end some. The extra hump you see below 30 Hz I believe was due to a loud knocking sound that the PR's began producing as they began to cantilever. Now this was just using a pure sinewave, not your typical bass material you'd get from a movie or even most music. When watching movies the passives do not move enough in a consistent motion to begin this rhythmic cantilevering action, they actually behave fine and cause no problems. The biggest drawback to this design in the 10" driver bottoms out easily at low power. Explosions and car crashes cause the drive to "pop" badly. But he driver is pretty crappy and a 30 Hz tuning doesn't help. Any content below 30 Hz will drastically cause the driver to exceed its Xmax. For future designs, tuning needs to be closer 20Hz and the driver needs more Xmax.